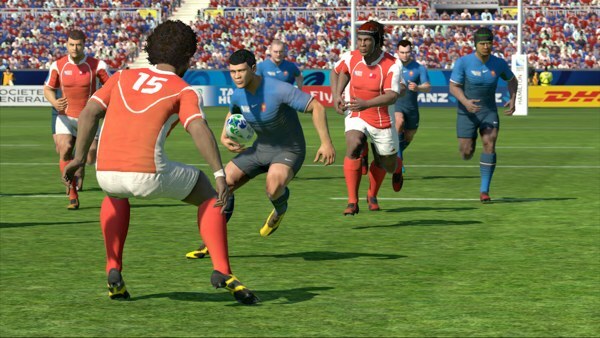 Flip Out Mama: For The Gamers: Rugby World Cup 2011 Review! We were recently given the chance to try out the new Rugby World Cup 2011 for Xbox 360. Now, I will start off by saying that sports games are not really any of my boys cup (cups?) of tea. They normally go for some kind of shoot 'em up game instead. I was not sure how they were gonna receive this game. I am happy to report that my boys enjoyed this game thoroughly, although not as much as they would if it had been perhaps, football, or NCAA basketball, of course. I must say that none of us are all to familiar with rugby as a sport, so that made it a little more difficult for them to learn what they were doing in this game. The game was a little "FIFA"ish, they report. They really love that game, so I guess that is a good sign. They did tell me that they wish that the game would have had some sort of tutorial mode. They say it was a little hard to learn the controls and what not when just being thrown into a game. But once you get used to the gameplay and the way that everything works, it can be a really fun game! Bottom line, this could be a great game. IF you are really into rugby, and if you have the patience and willingness to learn how to play. Otherwise, you might get frustrated and not have very much fun with it. My boys enjoyed it, but I am not sure it is a game they will be playing months from now. We received a copy of this game in order to conduct this review. Although a sample was received, all opinions are my own and no monetary compensation was received.